Some plants will require special care during the cooler months. If the forecast is anticipating freezing temperatures, there are some necessary steps to ensure your flower beds will survive. 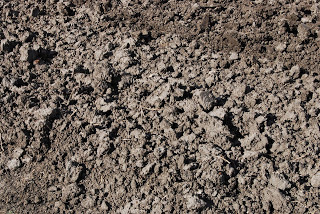 Keeping the soil moist helps to prevent cold air from permeating it, thus damaging tender roots. Mulching also retains heat and moisture, providing an additional level of protection for your garden. When freezing temperatures are predicted, cover tender plants with fabric or paper or plastics; however, if plants are covered in a non breathable material, be sure to uncover them first thing in the morning. If you don’t uncover them first thing, the plants may suffocate. 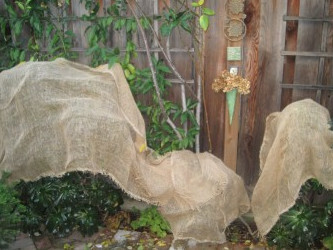 I personally suggest using burlap for trees and shrubs. Hardy perennials (what is a perennial) would actually be well taken care of by the winter itself if they were covered in a mask of snow. The problem comes when there might be a little snowfall but it doesn’t really stick or simply just darn cold, which then brings the frost. This unmerciful force of cold temperatures can kill many plants and trees even if they are hardy (i.e. ready for the cold). Be very careful if your landscape has a poor drainage system. If snow melts and the water sits on your soil for too long, what can happen is something we call root rot. I’m sure you can tell just from the words that “root rot” is not something we want to happen and can kill your plants. One thing I suggest you do if your trees and shrubs are relatively young (or recently transplanted) is to water them deeply before the winter cold freezes the ground (see also our irrigation article). You can even take it a step further and spray your evergreens with a sealant called, Wilt-Pruf, which helps lock in moisture. What do you do when you’re in the house, on the couch and cold? You cover up, right? So if the ground outside is going to freeze, guess what you can do to help keep it warm? Cover it! 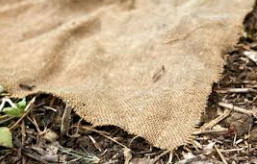 Grab yourself a little more of that burlap we talked about earlier and use it as a blanket on the ground in sensitive areas around your plants. Be creative if you have to, just make sure the ground surrounding your plants doesn’t freeze if at all possible. 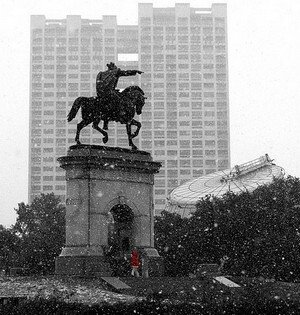 Okay so it’s cold out, but what makes it feel even colder? Wind. If at all possible, try to cover your smaller plants with some kind of windbreak. Use a helmet, towel, bag, pot, or whatever. Feel free to be creative here. 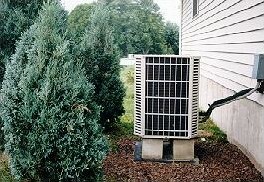 Don’t forget, though, that plants need to breathe too, so make sure if what you’re using restricts airflow too much that you uncover it during the warmer part of the day for a bit. Also, the reverse is true. Don’t let the cover overheat your plant when the sun comes out. A little bit of snow doesn’t weigh much, but a lot of snow on leaves and branches can begin to weigh down the branches of your trees and shrubs. If they become too heavy, the branches could break under the stress. Gently knock off piles of snow from the branches starting from the bottom and working your way up. Be gentle, though, you don’t want to break the branches yourself. 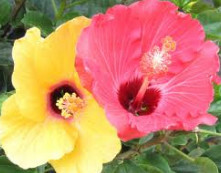 If you have delicate tropicals, however, keep in mind that they will need to be dug up and stored in a greenhouse or some other shelter no later than November 1st of every year. These kinds of plants may not harden enough for the winter cold. There also are a few points in maintenance that coincide directly with winter. First off, don’t prune in the Fall. When you prune a plant, it encourages new growth. The new growth will be susceptible to the extreme temperatures of winter. Secondly, avoid applying fertilizers that are high in nitrogen during the Fall. The nitrogen also encourages new growth, which is unwanted just before winter. 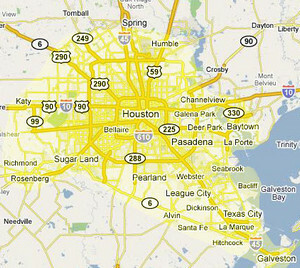 Keep these points in mind when gardening in Houston during the colder months. A heavy tropical landscape will entail a lot of work to preserve the plants over winter. Plant tender varieties alongside areas that offer protection from the elements, such as fences, walls and sturdy shrubs. Educate yourself of the species you chose for your garden, and be prepared for any additional care that may be needed over the winter months. There is nothing more attractive than a lush healthy lawn adorned in a beautiful array of color. This is not only limited to spring, but it can be accomplished year round. By choosing the right flowering species and knowing when these plants bloom, you can strategically plant your yard for a colorful show year round. Seasonally, garden centers will showcase colorful flowers for sale in flats. Flats are immature plants sold in small containers and are commonly used as bedding plants. 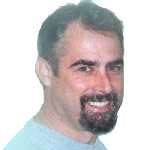 They are rapid growers and should be spaces 8-12″ apart in a flower bed. These plants are usually annuals, meaning they will only last for one season. Perennials, in contrast, last several years. 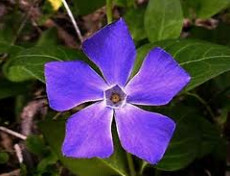 There are also some annuals, such as the periwinkle (pictured) that behave as perennials because they reseed themselves every year. These types of annuals may die back in the colder months, but reappear as warmer weather approaches. While landscaping in Houston and considering weather changes, there are several species of plants that will adorn your landscape with color despite the climate changes. Our area has basically two seasons, we have a warm season and a cool season, and there is an array of plants that are suited to each season as well. Adding color to your garden is not limited to just flowers. There are plenty of colorful plants as well that can paint your landscape with an array of color. 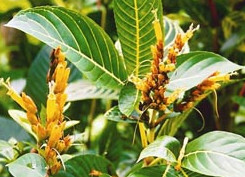 Sanchezias (pictured) have yellow-green foliage, and amaranth will show of it’s reds, yellows and oranges. 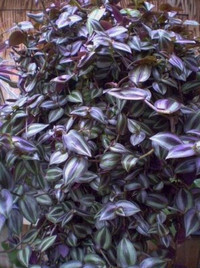 The wandering jew, with its greens and purples will liven up shady areas of your yard. In Texas, there is also a wide array of wildflowers that can give your garden a color burst. Bluebonnets, Indian paintbrushes and buttercups are just a few to name. Many wildflowers are produced by bulbs, tubers corms and rhizomes. 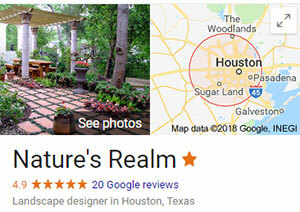 Houston gardeners are finding that planting colorful wildflowers in place of the higher maintenance annuals make gardening a breeze and are supporting state conservation efforts; however, it’s important to note that obtaining wildflower specimens must be done through local garden centers or nurseries. It’s against state law to collect plants from the wild. Seed companies or nurseries are the best way to start your own personal wildflower garden. To obtain year round color, simply following these simple steps will enable your landscape design to remain colorful- despite the season. Utilize shrubs and plants that have colorful or variegated leaves. Plant spring blooming bulbs in the fall, summer blooming flowers in early spring. Pay attention to sun loving and shade loving species. Plant colorful cool weather flowers in flower beds in early fall. Plant annuals in early spring. Shrubs are another layer of the backbone of a garden. 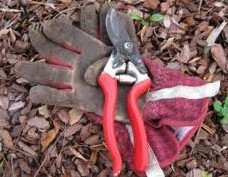 Shrubs also add to the landscape by offering assorted leaf sizes. 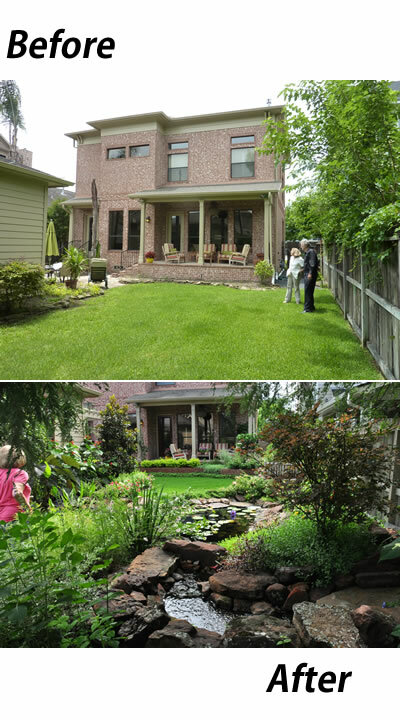 Leaf sizes are something that homeowners seldom consider in designing landscapes. Well designed landscapes take into accordance leaf textures, shapes, colors and sizes. For example a landscape with too many small leafed plans can appear to be too busy, whereas too many large leaves in a garden can be overbearing. Too much texture can appear sloppy and not enough texture can be dull and uninteresting. Dwarf shrubs help to create this variety. By planting dwarf shrubs in areas such as between ground covers and trees creates a border, and also adds color and texture as well. 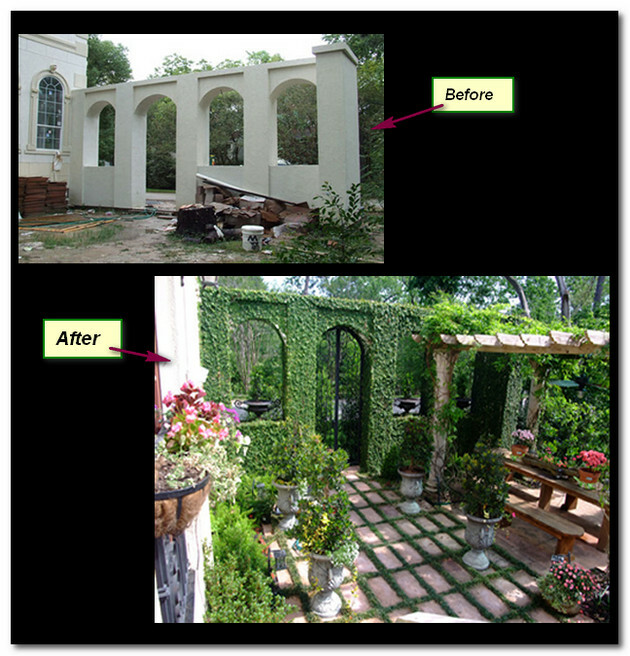 Placing them in visual locations as well such as along walkways and patios enhance the curb appeal of the home. Maintaining dwarf shrubs is simple, they naturally remain compact and low lying as their name implies. In most cases, pruning is rarely needed. Larger shrubs, for establishing a boundary or to offer privacy can consist of azaleas, lingustums, pittospoums, and yaupons are excellent hedges that are easily cared for. If desired, Camellias can also be used, however, they require more maintenance. In return they will give you color during the more dreary months of winter. Shrubbery choices can greatly enhance any landscape design, providing proper attention is given to showcase an assortment of color, leaf size, shape and texture. As mentioned earlier, trees are part of the backbone of a garden. They can serve as a focal point, or as a source of shade for plantings below, they can frame a garden, or establish the overall feel of the landscape. Not only do trees enhance a landscape, but they also serve as homes to native birds and animals in our ecosystem. Trees create oxygen and help to reduce pollution in the environment. 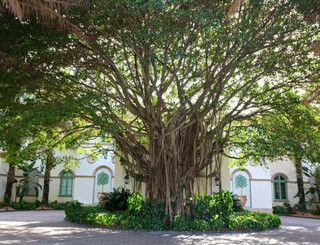 Primary trees are usually the larger more prominent trees for the yard. These are usually placed by the builder at the time of construction. Secondary, or supplemental trees are used to add additional focal points and symmetry to the landscape. In deciding on which trees to landscape a yard with, it’s very important to make some considerations on what you’re going to do. 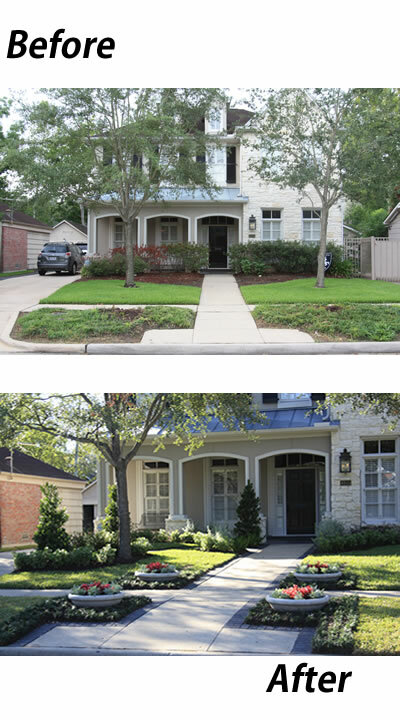 As trees are costly, finding the most suitable area for both the tree and design of the landscape takes top priority. The slow growth of trees needs to be addressed as well, and also the size at maturity. Over planting trees too close together can result in awkward growth and shape. Planting several shade trees can greatly limit what plants will be able to thrive beneath the shade. Depending on the nature of the tree, specific areas fare better for certain trees. Deciduous trees are best planted on the east or south side, so that they can provide shade during the summer months, yet also allow the sun to warm the home in winter months. In addition, the location of trees should not hide the home, but rather frame it. Roots of trees can easily damage pipework creating costly repairs in the future. A tree planted too close to a house also puts the house at risk of roof damage due to growing and maturing limbs. In most cases, hiring a professional to plant the tree is recommended, unless the trees are very young and small. Proper maintenance is essential at all life stages of the tree. 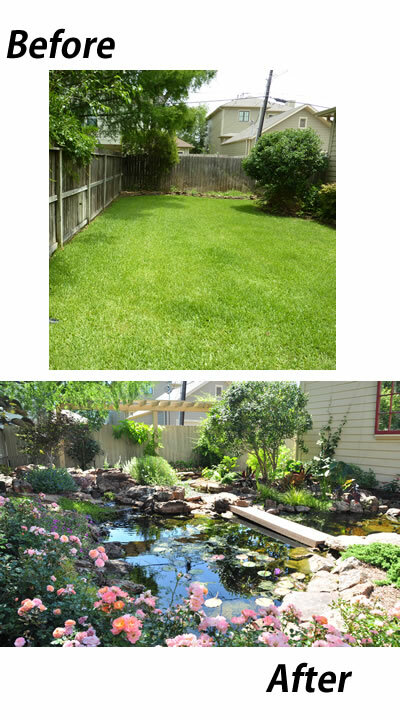 Fertilization, watering and pruning improve growth and health of the tree, as well as pest inspection and management. Vines and other climbing plant species should also be properly maintained and pruned to prevent any damage to the tree as it grows. 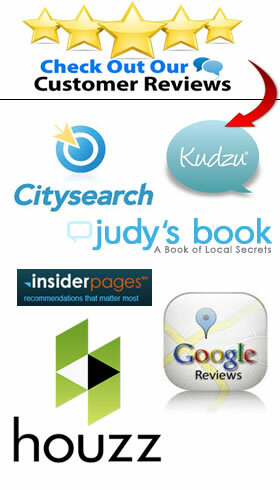 These are just a few of the many that will thrive in the Houston area.